Name: Nancie King Mertz, PSA, MP. Bio: Nancie King Mertz was born and raised in Central Illinois, where she began painting and selling her work in her early teens. She received a BFA in Painting from the University of Illinois, where she was a James Scholar, and also where she met her husband, Ron. They settled in Central Illinois and Nancie pursued a Masters Program in Painting at Eastern Illinois University where she taught for 3 years. She conducts destination workshops and local demos, and serves as a juror for shows in the Midwest. In 2011 she was an Artist-In-Residence for the National Park System and in 2014 she was named a Master Pastellist in 3 international pastel organizations: Pastel Society of America, Chicago Pastel Society and International Association of Pastel Societies. Other memberships include the Degas Pastel Society, Salmagundi Club, Oil Painters of America, and the Indiana Plein Air Painters Association. The February 2015 issue of the Pastel Journal featured an article on her work, and put her on the cover. Several magazines have chosen her paintings as "best-of" over the years. She was twice named Artist of the Year by the Chicago Convention & Tourism Bureau, and her work is featured on many Chicago-based television shows including The Good Wife and Chicago Fire. While in graduate school, Nancie began a gallery/framing company which she has continued to operate after re-locating to Chicago in 1987. Her husband joined her in the business in 2000. Subject: Nancie’s work varies in theme from urban to landscape, figurative to interior, much of it painted on-site. Style: Nancie’s oils and pastels are Impressionistic in style, with 60% of her work created en plein air. She paints approximately 100 pieces annually and has traveled to over 20 countries. Navigation: All links remain available at top of page. Gallery: Nancie’s gallery is classified by geographic location in the main. I chose Ireland for obvious reasons. Image View: Thumbnails open in a viewer, and may be scrolled. Images are well labelled, and may be saved. 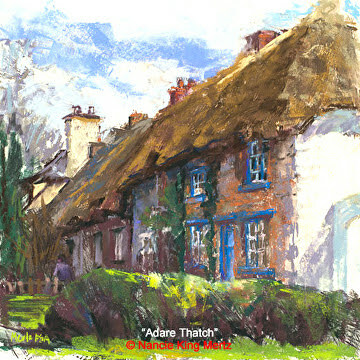 Adare Thatch is 16 x 16 ins. My own work is now posted on a separate blog, which will describe the genesis and process behind each piece. The name of the blog is Pastel Progress. The stated purpose of this blog is to list and review the websites of artists who work in pastel. For the artists featured there is the added benefit of having more traffic directed to their site. I am always interested in hearing from artists who would like to be listed. Email me at oldenbroke@gmail.com. It is generally recognised that reviewers may make use of material that is copyright for the purposes of review. I operate under that principle. It is not always possible to request permission of artists to use an image of their work in this blog, especially if the artist is not anglophone. I hope that all artists understand that posting an example typique of their work is essential to the generation of interest in their oeuvre. This blog aims to be an international directory of artists who express themselves wholly or substantially in pastel. Websites are listed by surname followed by first name, over several pages. The format is a short dataset of essential details about the artist and the site, with a type image of their style. It does not attempt to critique the artist or his/her work, but it does have remarks to make about ease of navigation, labelling of artwork, and image download - an essential learning tool for the student of pastel. Publications are only mentioned where an artist has authored a book - there are too many journal articles to reference. I have on occasion referred to an artist as being in my "top ten" - I have yet to list ten such, and my criteria for inclusion in this exclusive club include a unique vision, a unique expression of that vision, and inspirational material. As an example, I can cite someone who has no website and who will not therefore appear elsewhere on this blog- the wonderful, masterly, inimitable Jane Lund. I have been painting with pastels for 25 years or so, and have learned from the very practical publications of artists like Alan Flattmann, Daniel E. Greene, and more recently Richard McKinley and Ellen Eagle. The work of other artists who work in the medium is always of interest, hence this blog, and I am happy to have met many of them, and interviewed some for the Pastel Journal. Still Life is the subject matter that most interests me, and my pastels have been exhibited in Ireland, in France and in China.